På denne rundtur krydstogt fra Perth til Fremantle, beundre Perths flodbredde, mens du rejser ned ad Svanen, og tag en sightseeing sporvognstur i Fremantle for at se de største vartegn i denne historiske havneby. Derefter ombord bådene for returtur til Perth, hvor du nyder en frokostbuffet på vej. Din Swan River cruise starter i det centrale Perth, hvor du styrer din båd og sætter dig ned ad floden. Lyt til ombordfortælling, da du beundrer udsigt over byens skyline, havnefronter og yachtklubber, der gør din vej mod Fremantle, en havneby på den anden side af floden, hvor den møder Det Indiske Ocean. Når du ankommer til Fremantle, hop ombord på en sightseeing sporvogn tour for at se sine historiske attraktioner, og derefter tilslutte dit krydstogt at vende tilbage til Perth. Spis på en frokostbuffet, inden du kommer tilbage i byen, hvor din tur slutter. An enjoyable afternoon, both on the water and on the tram. Sometimes difficult to hear the captain’s commentary over the boat. The tram tour around Freo was excellent with our guide, Rowan. We had an absolute ball in Perth, a lovely city , clean and well set out , great transport system, easy to get anywhere, fantastic free buses in the CBD. Cooks Cruise to Freemantle was very pleasant, good dialogue from the skipper. In Freemantle the Hop On Hop Off service was second to non, the tram driver Rowan new exactly what he was talking about and was very helpful. Back on the Cooks Cruise we had a lovely dinner including W A Prawns sailing back to Perth. John and Debra Adelaide. But, the tour on the tram was better, besides the interesting sites the guide was humorous and it did make a difference also to what I remember from that tour. Recommended for anyone visiting Perth. Great cruise down to Fremantle with commentary from the crew. Tram tour of Freo was great with a knowledgeable and funny host/driver. Nice mral on the return trip. We enjoyed it very much! A great day out and a mostly gluten free lunch the menu was online at Captain Cook Cruises. The cruise to Fremantle was relaxing and enjoyable. The tram was really a small bus however the driver guide was good. The buffet lunch was good and all main dishes except one were gluten free. This tour is great if you dont have a lot of time. 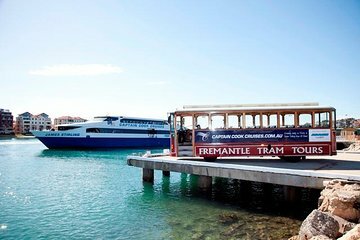 It enables you to cruise the river and have a quick look around Fremantle. I would like to go back to Fremantle for a couple of days now that I have had a brief introduction to this historic city. Recommended for a short stay in Perth. Very good but we would have liked some free time in Fremantle before our return to the boat. Perhaps there was an alternative tour available which we may have missed. Definitely a tour worthy of commending, leisurely and informative. Kudos to the Captains of the cruise and tram-tour. A must when visiting Perth - highly recommended. Cruise and food was very good on board,but on the tram we were rushed through. A great way to see Freemantle in a morning. The river cruise is relaxing and gives you a different perspective to Perth. The tram tour takes you to all the main areas with a couple of short photo stops you need to stay on board for the entire route to make it back on time for the lunch cruise. Our tram tour guide was very informative with a great sense of humour. Lunch was a three course buffet with soup to start, cold and hot main course option with salads and cake. There was complimentary tea/coffee throughout the cruises and a free soft drink/wine with lunch. The crew were polite and helpful and the boats very comfortable. Definitely worth the money.